Note, all charging cords listed below have bananna ends. These fit most chargers but do not fit ACE chargers. If you have an ACE charger, order the cord you need and the a #25 Futaba TX charge plug. Solder this plug to the end of your cord (after cutting of banannas) to make your ACE cords. This is the lowest cost way to get ACE cords. For any cord, be sure to check that it fits correctly and is polarized correctly for your TX. Transmitter Charge cord for above radios with 7.2V battery pack. At the time of this listing, only the SD-10G 2.4ghz radio from Airtronics takes this cord. All others use the 9.6V cord. These cords are quality made with 22 gauge wire. Length approximately 24." One end has the TX plug, the other has banana ends which fit most chargers. Correct plug for building your own customer charge and battery testing cords for the new Airtronics SD-10G.. Presumably many future Airtronics radios will use this plug. At the time of this writing only the SD-10G uses it. This plug fits several transmitter battery packs with odd plugs. If your Futaba or Hitec TX pack has a white plug, this pigtail will fit. Be sure to triple check polarity when building a charge cord. 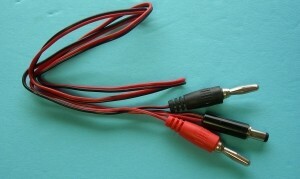 Transmitter Charge cord for all JR and Spektrum radios powered by 9.6V (8 cells). This would include any 72mhz or 2.4ghz radio ever manufactured any any other 9.6V powered TX's to follow. These cords are quality made with 22 gauge wire. Length approximately 24." One end has the TX plug, the other has banana ends which fit most chargers. 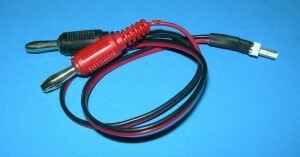 Note: An exception to the rule is this cord (this connector) is used on the Spektrum DX5e and DX6i which are radios that come equipped with 4.8v battery packs. 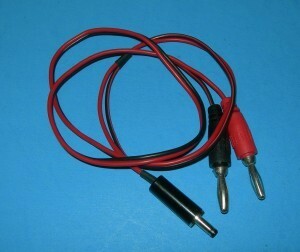 Plug for building your own TX charge cords for any 9.6V JR/Hitec or Spektrum 9.6V TX. Wire JR and Spektrum center pole negative, All others center pole positive. At long last, the first ever direct charge cord for the JR/Spektrum white TX plug. Fits any battery pack that ever came from JR with a white plug on the output wire like the DX8 and many others. Useful for fast charging or any general charging/testing outside the TX. Custom made in our shop. Medium length. Connectors directly to your TX battery pack for all JR and Spektrum (possibly some Expert and Cirrus TX's made also made by JR) that use a white TX plug. Use for building your own direct charge cord or other projects where you need to interface with one of these packs. At long last, the first ever direct charge cord for the JR/Spektrum Black T TX plug. Useful for fast charging or any general charging/testing outside the TX. Custom made in our shop. Medium length. Unplugging this cord from the black JR T connector requires light upward pressure from a fingernail or similar thin object. Correct plug for building your own customer charge and battery testing cords for the 4.8V JR DX8 transmitter. Presumably any subsequent JR 4.8V (4 cell) TX's will use this plug. 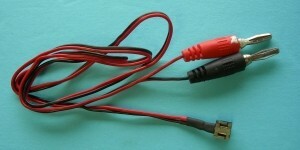 Transmitter Charge cord for all JR and Spektrum radios powered by 4.8V (4 cells). This would include the 2.4ghz DX8 and any other 4.8V TX's to follow. These cords are quality made with 22 gauge wire. Length approximately 24." One end has the TX plug, the other has banana ends which fit most chargers. IMPORTANT NOTE: CAUTION: Never plug in a peak detection or fast charger into your DX8 as this could damage the internal charge circuit. Use only a 12V DC source. Check your user manual and warnings for the DX8 TX and respect all warnings. 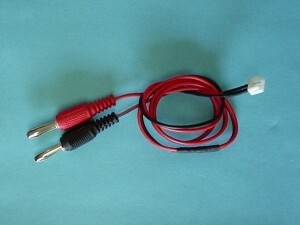 Transmitter Charge cord for above radios with 9.6V battery pack. This would include all modern (since 1980)72mhz and most 2.4ghz radios they produced. These cords are quality made with 22 gauge wire. Length approximately 24." One end has the TX plug, the other has banana ends which fit most chargers. Top unit in example photo at left. According to one customer this charge cord also works with the FlySky FS-CT6. Ace Transmitter Charge Connector for 9.6V Futaba Tx's. 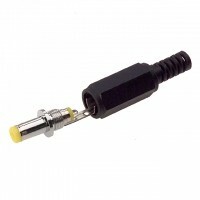 This is the plug that goes into your Futaba transmitter to charge the Tx batteries. 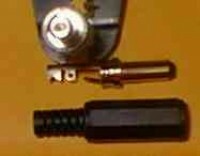 The center port of the plug (short spade internal connector) is negative. These are also used as output plug on Ace chargers. 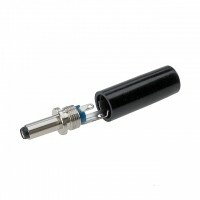 This is the plug that goes into your Futaba transmitter to charge the Tx batteries. 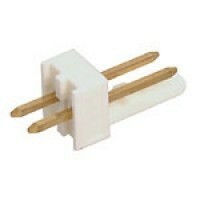 The center port of the plug (short spade internal connector) is negative. These are also used as output plug on Ace and Alpha 4 chargers. Above listed at $1.25 each. Choose your 6-pack deal here! Transmitter Charge cord for Hitec 7.2v Aurora 9 TX and Futaba 4.8v T4yF 2.5ghz and late 6J TX. These cords are quality made with 22 gauge wire. Length approximately 18." One end has the TX plug, the other has banana ends which fit most chargers. Uses our #17 TX charge plug (CTXPP17). Fits Futaba 4PK/4PKS/4PKSR/14SG TX. Futaba uses two different plugs for 6V TX's. This is the Thinner of the two. Measures 3.2mm on the OD or about 1/8". 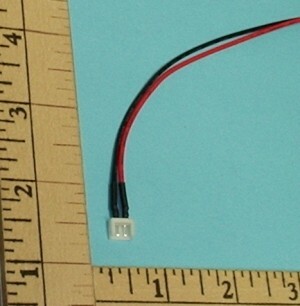 Transmitter Charge cord for above radios with 9.6V battery pack. This would include all modern (since 1980)72mhz radios and some 2.4ghz radios they produced. These cords are quality made with 22 gauge wire. Length approximately 24." One end has the TX plug, the other has banana ends which fit most chargers. Item is 3rd unit from top in example photo at left. Correct plug and polarity for Tactic 2.4 ghz 4.8V. At long last, the first ever direct charge cord for the Hitec white TX plug. Useful for fast charging or any general charging/testing outside the TX. Custom made in our shop. Medium length. Interfaces and polarizes corectly to the plug on any Hitec TX battery pack using the factory white plug. Use to build your own charge cords or other projects including these packs. Transmitter Charge cord for Hitec 7.2v Aurora 9 TX and Futaba 4.8v T4yF 2.5ghz TX. These cords are quality made with 22 gauge wire. Length approximately 18." One end has the TX plug, the other has banana ends which fit most chargers. Uses our #17 TX charge plug (CTXPP17). Correct plug for building your own customer charge and battery testing cords for the new Hitec Aurora 9 and any other Hitec 7.2V TX. Also correct plug for any Futaba 4.8V TX. At the time of this writing only the Aurora 9 and Futaba 8FG use it. Adapter, use on any Futaba TX charge connector as on Sirius chargers and factory wall wart chargers to connect to any Hitec TX charge port (except the Aurora 9 which is a different TX charge plug). Transmitter Charge cord to fit above radio. These cords are quality made with 22 gauge wire. Length approximately 24." One end has the TX plug of your choice, the other has banana ends which fit most chargers. Item is bottom unit in example photo at left. 9 Volt Clip 24" Direct Charge Cord with banana male plugs. Use with Battery Holder to recharge your AA or AAA cells. Heavy duty, durable, hard molded plastic 9 volt clip. Use this adapter to charge an RX pack from the TX port of your Sirius charger. May also be used to adapt wall wart (or other chargers) with Futaba TX charge plug output to Futaba J or universal Z type plug. For instance a TX pack from a Futaba Super 8U or 9C has a regular J type RX battery connector on it and you could use this adapter to charge that TX pack directly.